Little girls love everything about princesses: the beautiful dolls, the romantic love stories, the glittering play clothes. But girls’ princess obsessions bring more than pink sparkles into their lives: Pop culture princesses are part of an enormous and powerful marketing machine, encouraging obsessive consumerism and delivering negative stereotypes about gender, race, and beauty to young girls. What’s a concerned parent to do? 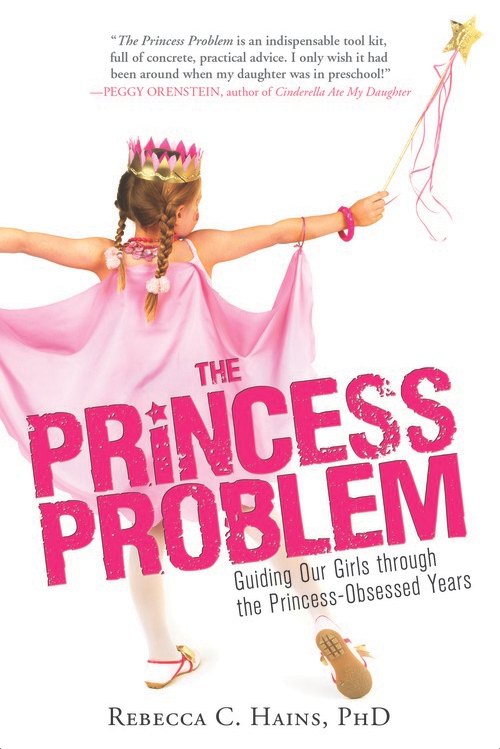 The Princess Problem: Guiding Our Girls Through the Princess-Obsessed Years by Rebecca Hains offers solutions, teaching parents a range of skills–from setting limits on media use to helping their daughters think critically about media stereotypes and consumerism. With their parents’ help, girls can arm themselves with the skills and resilience they’ll need to navigate popular culture and its many problems for years to come. Order now from Books a Million. Today’s parents are smart and thoughtful. They’ve become increasingly aware that princess culture segregates the girls from the boys, over-emphasizes physical appearance, and is full of gender and race stereotypes (with racial diversity far too limited to begin with). So what’s a concerned parent to do? Parents who want their children to be able to think critically about media messages can practice pop culture coaching, a powerful new method for raising media literate children. Chapter Two offers a straightforward, step-by-step guide to pop culture coaching, filled with helpful examples. This chapter explores how princess movies and products are marketed, why it’s so irresistible to young girls, and why it’s a problem. Then, using pop culture coaching principles, Chapter Three gives parents tips and conversation starters for helping their children resist marketing. Princess culture echoes a problem found throughout the media: the implication that physical appearance is the most important quality of a female. But girls and women are so much more than how they look! This chapter discusses why we are so biased towards pretty people and how princess culture reinforces this unhealthy attitude. Then, Chapter Four teaches parents exactly how they can help their young daughters beat the pretty princess mandate. Parents report they are concerned by the ways they see princess culture encouraging girls to be passive and subservient and to believe in the “romance” of superficial, unhealthy relationships. Brave and Frozen have offered big improvements in these areas—but does the merchandise? Then, Chapter Five teaches parents how to help their girls see through the gender stereotypes. Chapter Five also features an exclusive interview with Brenda Chapman, director of Disney/Pixar’s Brave. Princess products and films feature characters of color far too infrequently. They are underrepresented. Unfortunately, those that do exist have some limitations, including some racist undertones. Today’s parents want their daughters to overcome stereotypes and respect all races and ethnicities—both others and their own. Chapter Six gives parents concrete tips and examples on how to do just that.